I acquired three sizes of this face and I can’t find it in any catalog. Someone posted a reference to the Mac McGrew book, which I have just purchased. What a treasure! The 36 pt is shown. 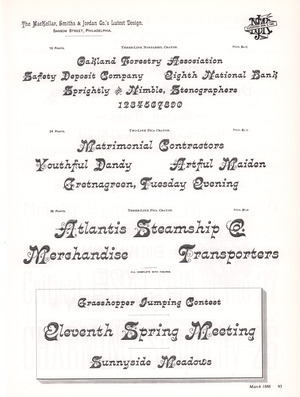 It reminds me of the heavy use of shaded, showy faces of early 1900s stock certificates. I’ve attached a photo of the lovely “and” ligature included with the font. There is a pin mark that I tried to photograph but I can’t make out the legend inside. The body has a half-nick as shown. The typeface is called Crayon. 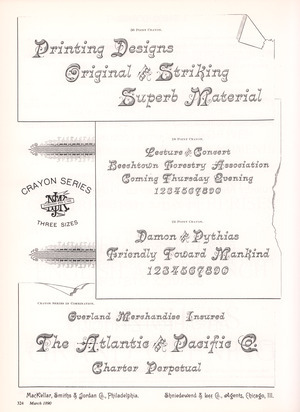 Crayon was cut by William Ihlenburg and the face was cast by McKellar Smiths & Jordan of Philadelphia. Patented February 9, 1886. Thank you sirs, and I appreciate the Inline Printer excerpts, now I can refer to the font by its correct name.